Prestige Chrysler Jeep Dodge is the #1 dealer six years in a row! Come see how we beat any dealer’s price! 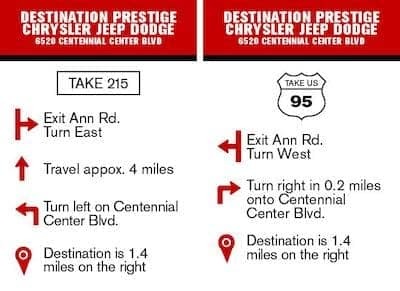 Prestige Chrysler Jeep Dodge LLC features the latest manufacturer offers and incentives on all new Chrysler, Dodge, Jeep, and RAM vehicles. Discover which offers are best for you and drive off in a new car today. Our experienced sales staff is eager to share its knowledge and enthusiasm with you. We encourage you to browse our online inventory, schedule a test drive and investigate financing options. You can also request more information about a vehicle using our online form or by calling (702) 706-0070. If you don’t see a particular vehicle, click on CarFinder and complete the form. We will gladly inform you when a matching car arrives. If you’d like to see a vehicle in person, stop in and visit our site, or give us a call. We look forward to serving you!